Does your quest to live a simple life seem like a dream, a task unattainable without a sacrifice, a hard to reach a goal or life only others achieve? It doesn’t have to be any of the above. I have learned that living a simple life comes from within, it is a feeling, a thought, a dream acted out, and it all started with me! I had to change my mindset and the way I look at life and when I did I could take the first steps to living a simple life. Tweet this: Simply living and living simple are two different things! Simply living is going from one day to the next with no purpose, no dreams, and no way of knowing what tomorrow will bring. 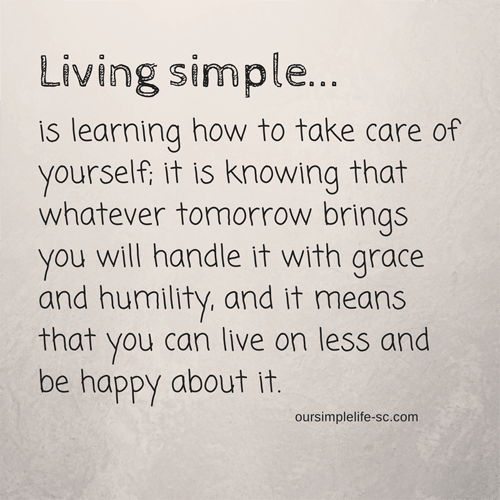 Living simple is learning how to take care of yourself; it is knowing that whatever tomorrow brings you will handle it with grace and humility, and it means that you can live on less and be happy about it. Don’t wait for that perfect moment, start today, right now, where ever you are! Step #1 – Write it down. • Take out a blank piece of paper and pen. • Turn off all distractions. • Take a deep breath and feel the peace of the quiet moment. • Close your eyes and picture what you want your life to look like. • Open your eyes and write down what you saw. Step #2 – What did you come up with? • Is it spending more time with your family? • Is it living a stress free life? • Is it feeling more organized and productive? • Is it getting out of debt? • Is it being more self-sufficient? • Or is it a combination of many things? The first steps to living a simple life starts with you and your first step started right here, right now! It does not have to happen all at once! Take it one step at a time and learn that no one is going to do it for you, but it is going to take you to start. 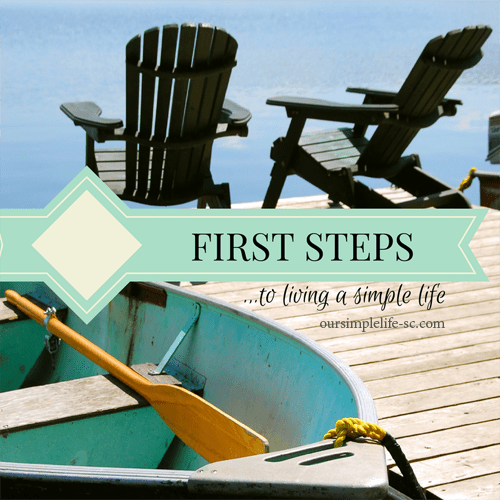 What does your simple living dreams look like? Tracy, do you have a link-up? For some reason I thought you did, but can’t find it 🙂 Thanks! Jacqueline I do not have a link up but maybe you are thinking of the Friday’s Fabulous Five? We actually wrote down our dreams and plans and we still look at them today. It really helped us to visualize them! I love this post. I will be turning the big 50 soon and I have been thinking about all these things. I truly need a simpler life. Thanks for sharing and linking up to Wonderful Wednesday Blog Hop. I am going to feature this on my Facebook page, Google+ page now. Thanks Jes…Art of Home-Making is one of my favorite hops! I really enjoyed this post, I will be featuring this on this weeks Tuesdays with a Twist link party on my blog. Come by for a peek, thanks again. Thanks Debra…I will be sure to stop by! What a great post Tracy! Come back on over to Happiness is Homemade on Sunday cause you are being featured!! Woohoo! I will be sure to stop by and see my feature. Thanks! So happy to find your site. We are just beginning to homestead. With 5 adopted children under the age of 9 (a piece of advice don’t wait till you’re 50 to adopt, lol) we feel it is the answer to prayer. We choose for our children to be raised healthy, responsible and secure in a way only the farm life can provide. We have struggled so, for the last few years just providing food for this bunch that we will have the peace of mind that the farm will provide that and so much more. Keep providing all the helpful information my friend. I was raised on a farm and there is something special about farm life that I just can’t explain. Your kids will thank you for it someday! Good luck to you! Tracy, you always seem to amaze me. Your posts lift my soul and help me to think of life on a grander scale. You are a blessing from the Lord to me, and I just wanted to let you know that. I do not always post a comment…just know I take for granted your daily blessings in my life. May the Lord continue to bless you and your family. Thank you so much Ellen for taking the time to tell me how much you enjoy the site!